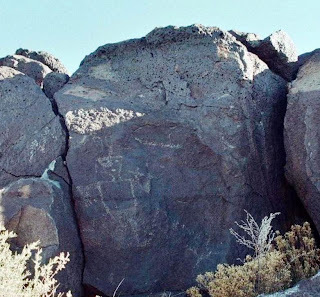 As my wife, Carla, and I were leaving Albuquerque, N.M., we saw signs for the Petroglyph National Monument, located a few miles off Interstate 40. This started me on a short course learning about petroglyphs, or Indian pictures, chipped on the sides of big stones or on canyon walls. I had several of these short courses going at the time because so many tourist attractions in the Southwest revolve around a few topics such as pueblos current and ancient and the Indians who lived in them, local dinosaur digs and the ancient geology of this area. 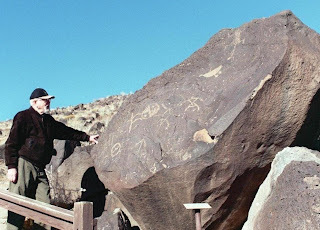 At the entrance to the petroglyph monument, the National Park Service offers a visitors center, and three miles farther on are three short walking trails to view the petroglyphs. Climbing the first trail took us to an overlook where we could view the area, which is largely desert. But where it isn’t desert there are closely packed houses in the Spanish style. You can tell it is a rain-challenged area by the limited plant life and number of flat roofs. The question left unanswered for me was, with so much desert to build on, why do they crowd the houses so close together? Some petroglyphs had signs, but they didn’t give the meaning of the drawings. For example, one said: "Pecking makes petroglyphs by percussion - hitting the rock surface with a tool. Some pecked glyphs were made by positioning a chisel-like tool against the rock and striking it with a hammer stone. A pecked petroglyph will have a rough, pitted surface in the worked area." Another sign noted that if the figure was painted on, it was called a pictograph. The images have spiritual meanings, but the Native Americans aren’t about to share that information. That aside, we understand that the different pueblos disagree on the meanings. The earliest artists were probably Anasazi, but Hohokam and Mogollon also made them and later people continued the practice. Even today, modern Native American artists incorporate these designs into their work. Besides the animals and certain standard shapes, one figure appears again and again. Usually playing a flute, Kokopelli is a stick man with a hunched back or perhaps a pack on his back. He was considered a symbol of fertility, a seducer of women and a trickster. Shortly after he would visit a village, many of the women would become pregnant. Consistent with that characteristic, in some of the petroglyphs he is dancing, and sometimes he has an exaggerated phallus. But there are other interpretations. That backpack might indicate that he was a traveling peddler, since trading was evidently done over a wide area. 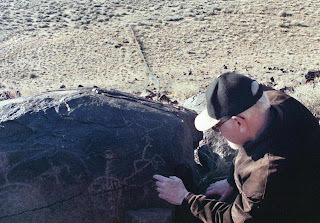 It is now a federal crime to vandalize a petroglyph. Seashells, feathers and other objects not from the area are found in the ruins, and pots from this area are found in Mexico and other places around the Southwest. One of our informants said the stories about him might be similar to those jokes told about the sexual behavior of traveling salesmen. Sometimes Kokopelli has a feather on his head or rabbit ears, and occasionally he takes the form of an insect. Besides being used as an object in petroglyphs, he shows up on pottery. One problem is that petroglyphs were unprotected for many years and graffiti artists had a chance to work the area. The first were the sheepherders whose markings are simple things such as crosses. The later work by tourists and locals isn’t as deep into the surface as the original work and lacks character - that is, it’s mostly initials or scratches. 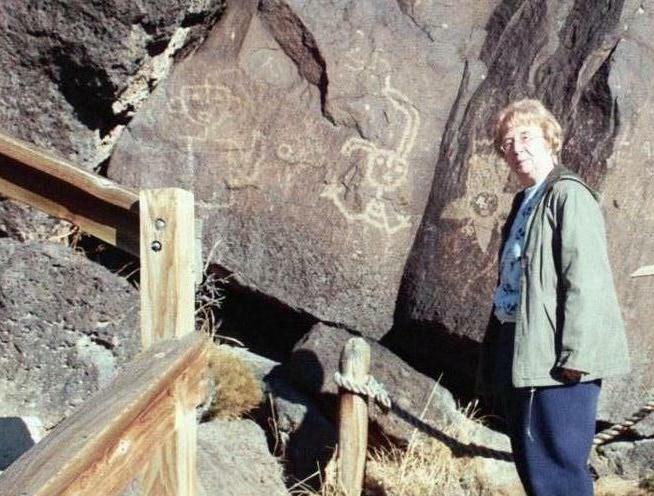 Since some tourists took broken off petroglyphs, it is now a federal crime to vandalize a petroglyph. The finest petroglyphs I saw on this trip were in the Painted Desert and Petrified Forest at Newspaper Rock, just across the border in Arizona. At first I couldn’t see them clearly from the viewing station, but with binoculars they stood out sharply. Many other places in the Southwest have good displays. In Phoenix, reproductions of common petroglyph forms are used as decorations on walls, bridges, overpasses and even on the sides of parking garages. Like many travelers, we were so taken with Kokopelli that we had to add shirts with his image to our wardrobes. The mystical meaning of many of the objects is unknown.